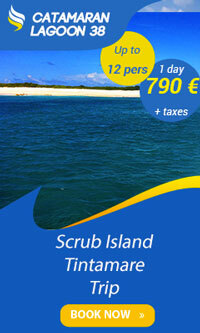 Sail to Tintamare island, swim with sea turtles, snorkel among colorful fishes, discover the island. 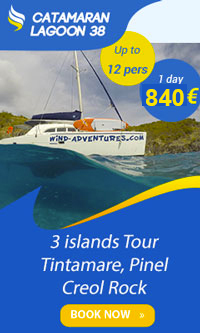 Sail to Ceol rock (snorkel) and discover Pinel island (lunch in Pinel possible, extra). 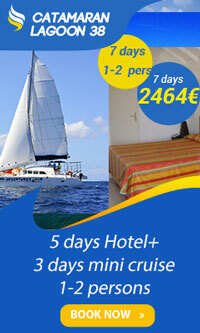 Included: snorkeling equipment, 2 S.U.P, drinks (soft drinks and beers). 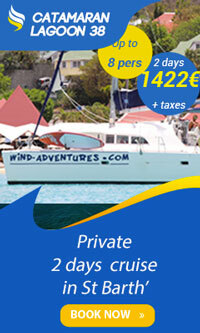 Sail to St Barth (2,5 hours) and spend a night aboard the catamaran (up to 8 persons). 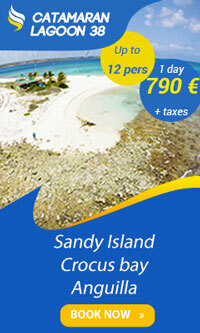 You will discover Fourche island, Colombier (snorkeling), ST Jean (best stand up paddle spot), and shopping in St Jean. 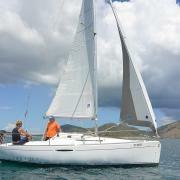 The triangle St. Martin, Anguilla and St. Barts is perfect for short sailing. 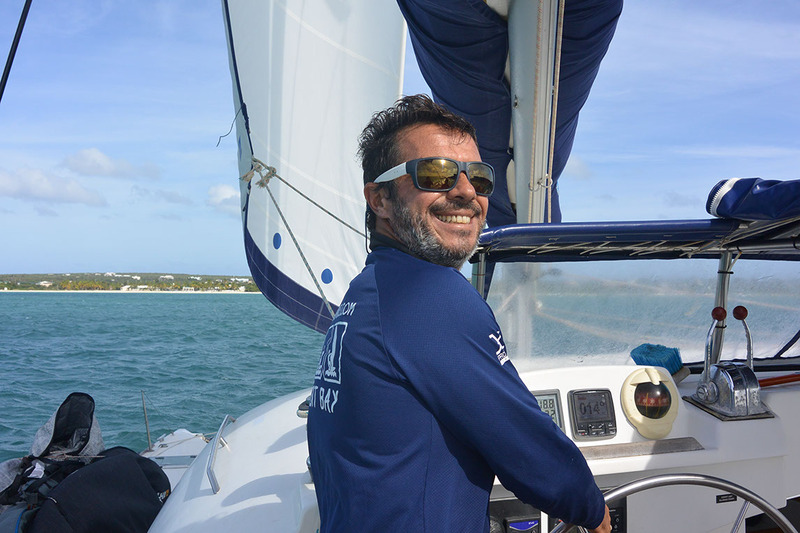 Longest navigation will be in ST Martin and St. Barts (3:30) with a possible stop on Fourche island making the cruise available to families. 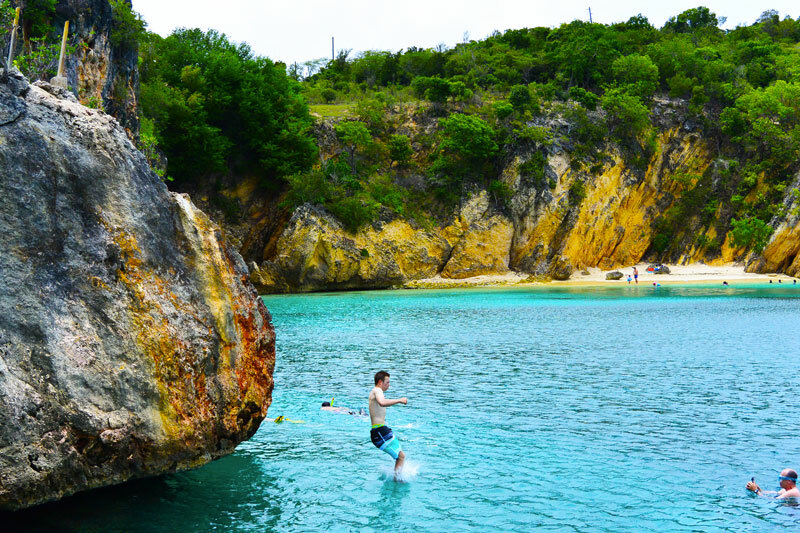 The majority of kitesurf spots are on Anguilla . 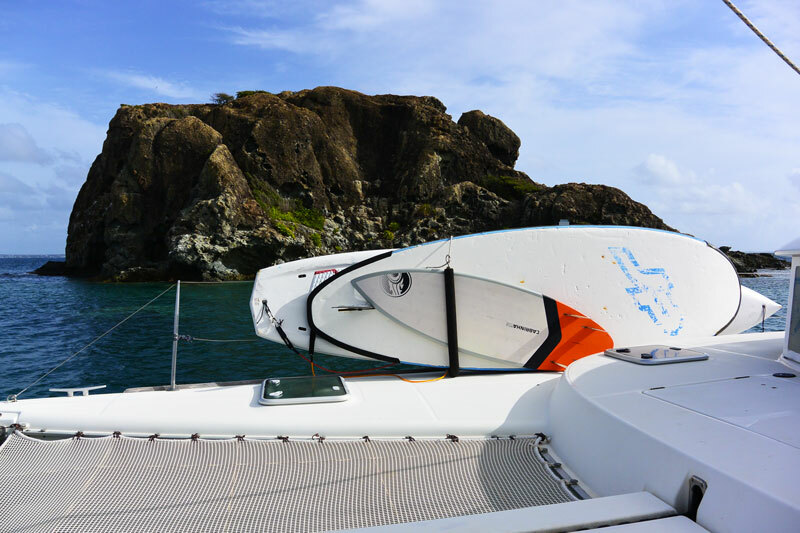 St Barthelemy is reserved for exploring more of the island (St Jean). 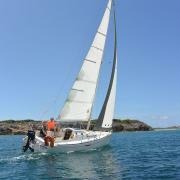 Orient Bay St Martin, will be a step on the road for kiting and windsurfing. 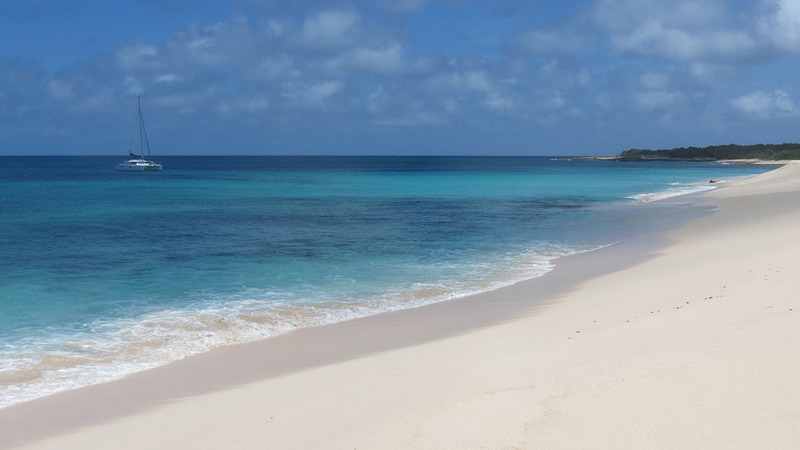 Anguilla: The island of Anguilla has the third best beach in the world (Shoal Bay) for the smoothness and whiteness of its sand. You will be dazzled by its deserted beaches and turquoise waters. Cove bay: a sandy beach 1.5 km, facing east with a side-shore wind, perfect for intermediates who want a secure site. On the beach it is possible to eat at "Smokeys" small local restaurant (open for lunch and dinner). Sandy Island: a small island of sand and coconut trees lost to leeward of Anguilla, THE magical spot (20 minutes nav 'Road Town). Await you: a small lagoon with plain water (offshore wind), a small spot of wind and wave a huge playground around. A restaurant, open for lunch. Perfect for snorkeling, stand up paddle or idleness. 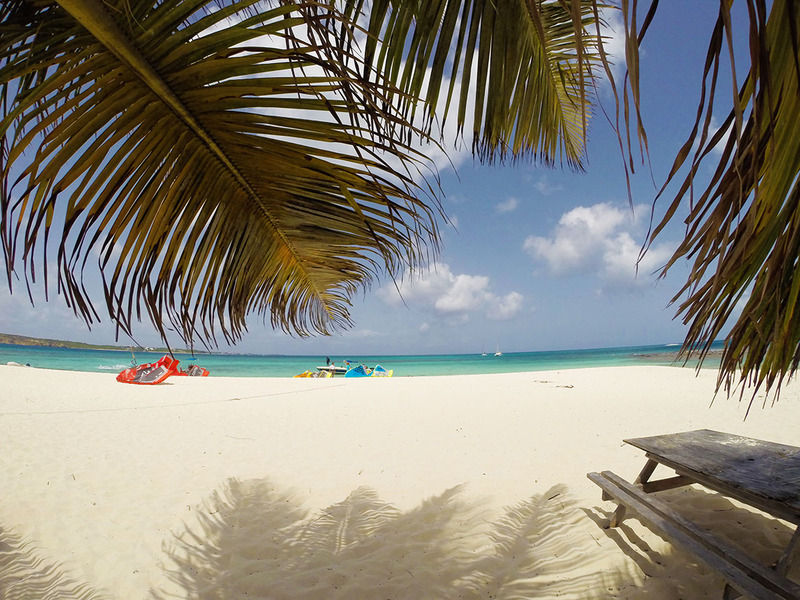 Meads Bay: beautiful beach of white sand west side (perfect for north wind). This is the beach or you can recovers after a downwind Sandy Island. We can also enjoy a cocktail at Viceroy luxury hotel. Prickly pear: another island located off the coast of Anguilla (a 3 miles). Protected lagoon and small wave spot. Snorkelling magic. Open for lunch there a beach restaurant. Road bay: small local village with its harbor. Protected anchorage. The best "Ribs" to "Pumphouse" local bar with live music. Anguilla harbors of reggae artists, such Bankie Banks, a former comrade of Bob Marley (possibility to visit the bar Rendezvous bay, near Cove Bay). Scrub Island: small island forming the northern tip of Anguilla, Scrub is part of the natural reserve of Anguilla. A nice trek can eternal organized to discover the fauna and flora (spawning turtles), the former airport and a magical spot of kite track. Scrub is 1.5 to 2 h of other spots and therefore is not routinely offered. 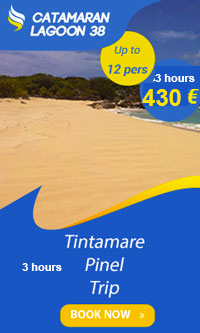 Tintamare: a jewel of the Natural Reserve of St Martin. 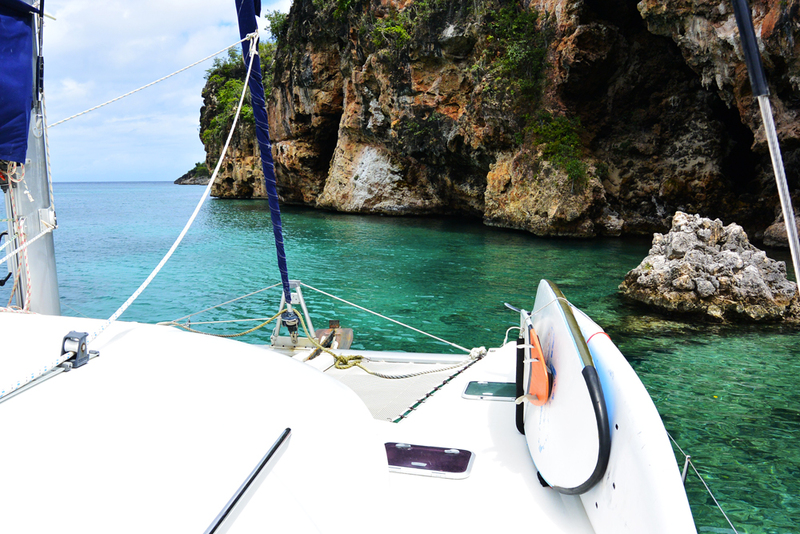 Tintamare is probably one of the most beautiful corners of the anchor. 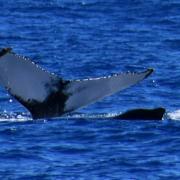 You can swim with sea turtles and winter you'll meet dolphins and whales. Beautiful sea and exceptional trekking funds to travel to the northern tip of the clay cliffs and natural jacuzzi. No restoration. 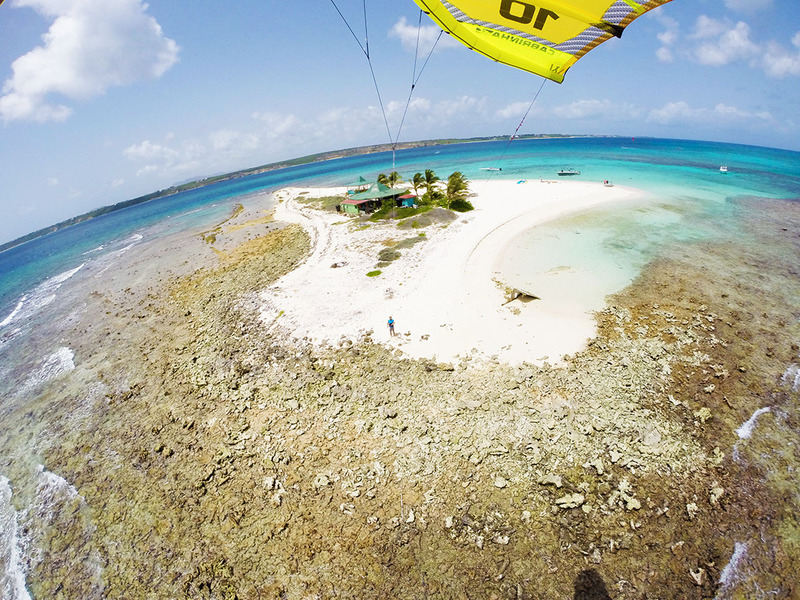 Orient bay: The Kite spot of Saint Martin. 1.5 km long bay with all possible activities. Pinel: beautiful fountain that will delight the family, snorkelling, hiking, iguanas. Two options allow you to taste the local fish. 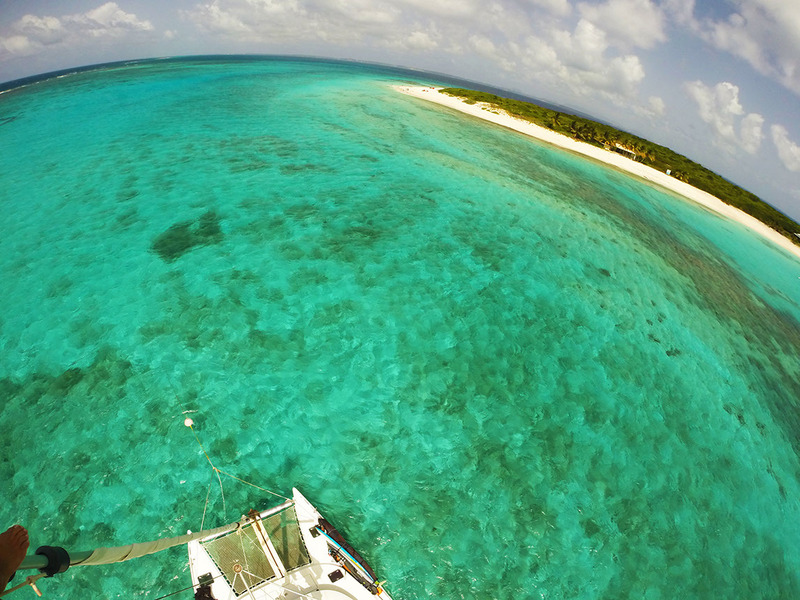 Green Cay: the islet Caye Verte offers a breathtaking view of St. Barts. The Lagoon Caye Verte is THE spot for kite. Its coral reef offers an excellent playground. Anchorage possible opposite. St Barthelemy Gustavia: Shopping in the capital (brands and fashion jewelry / jewelry). Colombier anchorage in the Nature Reserve, beautiful hikes. 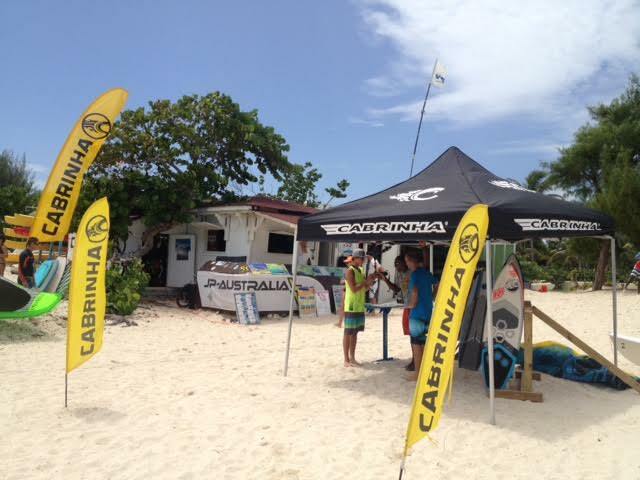 St John: Surfing, SUP and windsurfing. 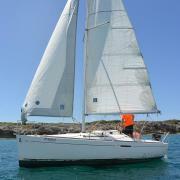 The skipper is proficient and experienced sailor. 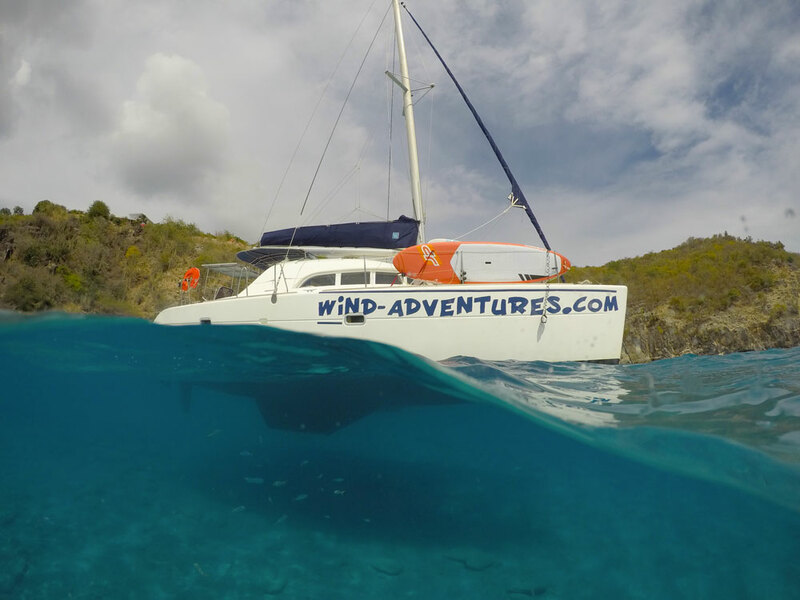 It is possible to embark abaord the lagoon for 3 days cruise in direction of Anguilla to discover the little paradise this one and its near islands offer. 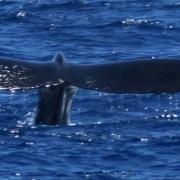 Day 2: After a 1:30 minute crossing, arrival on Cove Bay (Anguilla). A long deserted beach oriented side-shore, perfect for to upgrade. Possible meal at "Smokeys" in Cove Bay. 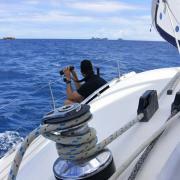 Day 3: Navigation to Sandy Island (desert island). Lunch on the island. Moorings at Road bay Meals possibleat Pumphouse (live music). Day 7: End of the cruise at Orient bay (noon). Price can be divided by the number of people (8 people maximum). Day 1: Boarding inOrient bay or Cul-de-Sac (9:00). After a 1:30 cruising, you arrive at Cove Bay, large bay with a deserted side-shore wind, perfect spot to start your cruise. Meals possible at Smokey (not included).